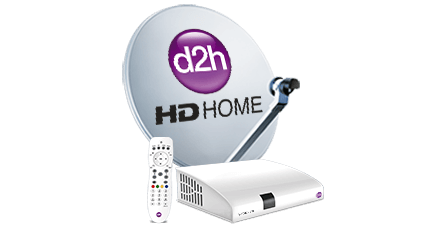 12th October Mumbai,: d2h, India's fastest growing DTH service has added 15 more HD Channels including regional HD Channels. With these additions, d2h will be now offering 60 HD channels & services. The lists of the HD Channels added are: SAB TV HD, & TV HD, Zee Cafï¿½ HD, Zee Talkies HD, Zee Marathi HD, Star Vijay HD, Maa TV HD, Colors Kannada HD, Star Pravah HD, Colors Marathi HD, Zee Talkies HD, Star Jalsha HD, Star Jalsa Movies HD, Colors Bangla HD, Star Sports Select HD1, Star Sports Select HD2. Zee Marathi HD will be available as soon as the channel is on air. The new HD Channels added are from wide genre including the regional language HD Channels as HD is the future of content and many more subscribers are tuning into HD Channels. These HD Channels will bring families together for shared viewing of their favourite programs in their language in High Definition. Very soon many more HD Channels will be added by d2h in the coming days and are aiming to offer 100 HD Channels. d2h has already announced 2 months long Khushiyon ki Diwali consumer promotion. As part of this promo , one needs to book a new d2h connection( HD @ Rs 1820 or SD @ Rs 1620 ( for South Rs. 1520) a and choose a monthly subscription plan, get FREE UPGRADE to next higher subscription plan for 60 days. The Existing subscriber of d2h can pay Rs 10 extra on their current monthly subscription plan and get upgraded to next higher subscription plan for 60 days. d2h has prided itself in presenting its subscribers with a robust line-up of more than 600 channels and services, including a host of regional channels. It offers a wide range of active services like smart services including Smart English, Smart Games. The other active services include d2h Hollywood HD, d2h music, d2h spice, d2h cinema in both Standard Definition and HD, etc. 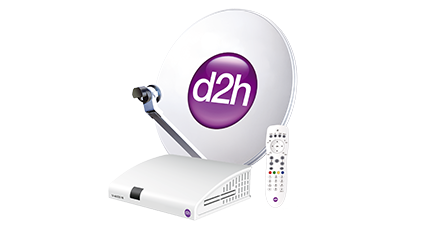 d2h is Indiaï¿½s fastest growing DTH service provider which offers over 600 channels and services. d2h is launching HD Smart Connect Set top Box (Connected Set top box) which converts your existing normal TV into a Smart TV. The Connected set top box allows one to browse content from Facebook, Twitter, Daily Motion, video on demand sites, news sites, weather sites, etc through applications residing on STB. Powered by the MPEG-4 and DVB-S2 technology, d2h transforms your TV into a hub of entertainment and knowledge. It offers a wide range of active services including Smart English, Smart Games. The other active services include d2h Hollywood HD, d2h music, d2h spice, d2h cinema in both Standard Definition and HD, etc. It launched Indiaï¿½s first 4K Ultra HD DTH channel service. d2h offers Indiaï¿½s first Radio Frequency Remote Control. 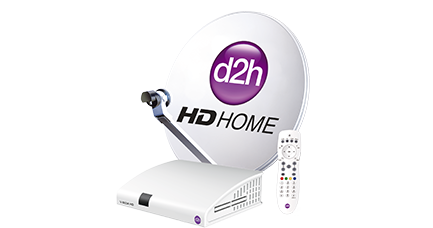 d2h also offers 60 ï¿½HDï¿½ channels and services. d2h has a pan India sales & distribution channel, superior service orientation & a track record of introducing technologically innovative product and service offerings. d2h has over 300 own service centres spread across 7500 top towns in India to attend and resolve the service issues within 4-6 hrs. SMART Services, a value-added bouquet of learning activities and games includes Smart Cooking, Smart English and Smart Games, all available on subscription basis. Smart services of d2h has something good to offer for every member of family right from an infant to a housewife. d2h was the first Indian media company to be listed on NASDAQ, USA. d2h has been awarded as Indiaï¿½s Most Trusted Brand 2016, Pay TV Operator of the Year at MIPCOM Cannes 2015, Asiaï¿½s most promising DTH brand 2013 & 2014, Indiaï¿½s Best brand by Economic Times 2014, Indiaï¿½s Most Promising Brand by Economic Times 2015 & recognised as top 50 dream companies to work for by World HRD Congress.